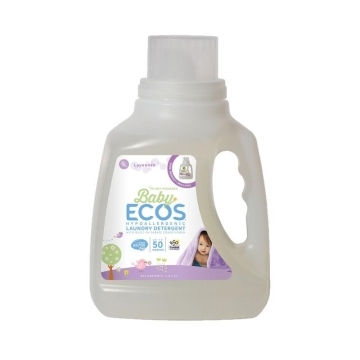 Created for a baby's delicate skin, Earth Friendly's Baby Laundry Liquid is hypo-allergenic and leaves clothes clean and soft. It is plant-based, environmentally responsible and includes soothing chamomile and lavender essential oil. It is also suitable for hand-washing delicates. Use just 30 ml per load on all fragrances and types. Ingredients: Water, Plant-Based Surfactant Blend (5-15% anionic, 5-15% amphoteric, <5% non-ionic), Phenoxyethanol (preservative), Alcohol Denat. (corn-derived ), Methylisothiazolinone (preservative), Lavandula Angustifolia (Lavender) Oil , Anthemis Nobilis (Chamomile) Flower Oil (N.O.P. Certified Organic).